When the weather is around 30 degrees C, we like to cook Mediterranean food because it’s very light. This side dish goes well with any kind of fish, or a vegetarian burger or scrambled tofu. When buying kale, look for crisp and dark greens. Avoid those that are wilted or have yellow or brown spots. 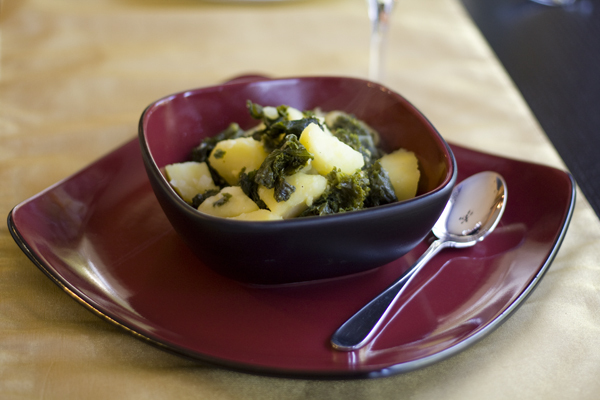 Young greens can be stir-fried, steamed, or sauteed briefly. 1. Cook the potatoes in salted water until soft. Drain. 2. 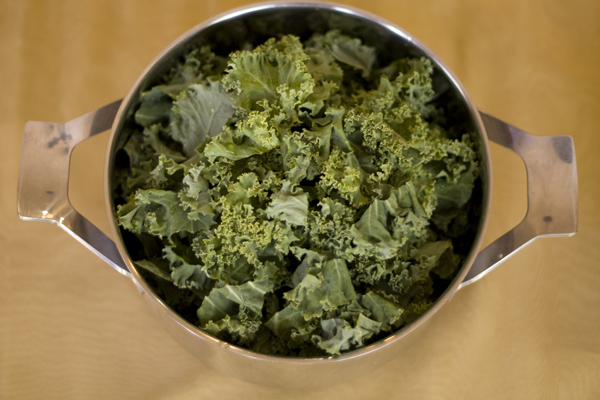 Rinse kale well in a large bowl of warm water. Drain in colander. 3. Use the leaves only. Trim away tough stem ends by making a “V-shaped” cut at stem end. Save the stems for vegetable stock! Cut the leaves into small pieces. 4. Heat one tablespoon of olive oil in a large skillet and add the pieces of kale. Cook and stir over medium-high heat 4 to 5 minutes until wilted and tender (older leaves may take slightly longer). 5. Heat 1 tablespoon of olive oil in a small skillet. Add minced garlic and saute for a few minutes. 6. 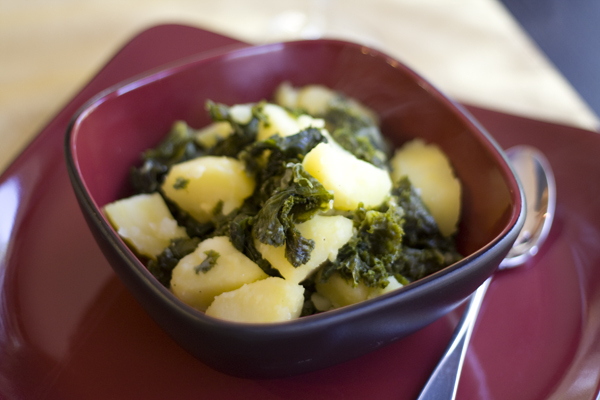 Add potatoes and garlic to kale, stir and heat through. Season with salt and pepper to taste.